Alexey Savinkov was born in 1999. He finished the Gnesin Moscow Central Special Music School (College) (Class of Dmitry Bulgakov) in 2017. Currently - he is a student of Estonian Academy of Music and Theatre (class of the same teacher). 2015 - I Prize Winner at Contest-Festival "Piano in Jazz"
He participated in concerts with the Chamber Orchestra "Province" under the leadership of I. Lerman and Orchestra "Camerata Russian" under the leadership of A. Kruzhkova He performs as a soloist with Orchestra "Gnesin Virtuosos". 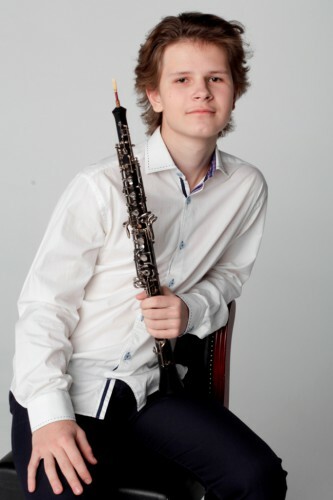 Member of master classes of the leading European oboists, including: Albrecht Mayer, Alex Ogrinchuk, Jean-Louis Kapetsali Nick Deutsch, László Hoddadi, Emmanuel Abbyul. He has participated in concerts in Moscow, Ryazan, Naberezhnye Chelny, Kostroma, Omsk and others.